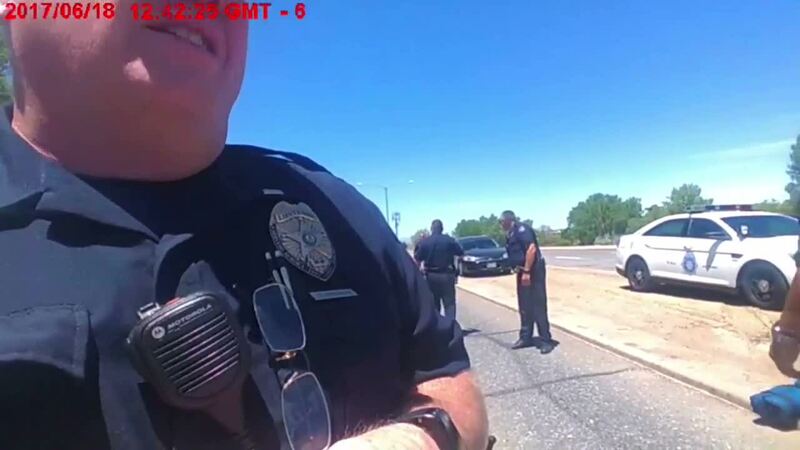 AURORA, Colo. — Body camera footage captured an Aurora police officer uttering a racial slur, but he is back at work after the chief fired him. Aurora Police Chief Nick Metz is condemning the comments and agreed to do an interview because he says he owes the community an explanation. "I reviewed the video, to say I was shocked was an understatement," said Chief Metz. The video shows two officers at the scene of a pursuit and officer-involved shooting on June 18, 2017. Former Lt. Charles DeShazer can be heard saying, "We have all the Alabama porch monkeys contained." The comment was not overheard by any members of the public, but the camera picked it up. Chief Metz said he took action as soon as he found out about the incident just a day or two later. The chief took DeShazer off the street to investigate the incident and then he was fired. “But I also look at what they did after. Do they take responsibility? Did they self-report? Did they apologize? Did they offer to do things to try and make the situation better or right?" said Chief Metz. 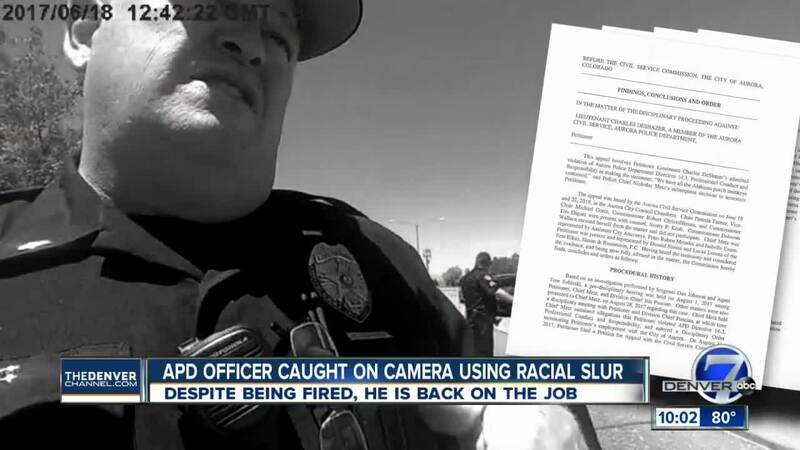 The officer filed an appeal, and the city's Civil Service Commission reviewed the decision to terminate him. A report was issued about the findings, calling the comment highly offensive and inflammatory, but it said the discipline was excessive. The commission heard the appeal on June 19 of this year, and the officer is now back at work. He will not be in a supervisory role or have any interactions with the public. "I respect their decision, but that doesn't mean I have to agree with it," said Chief Metz. Aurora's mayor released a statement backing the chief and said the decision to fire the officer was the right one. Other community members are also questioning why the officer is back at work. Aurora's NAACP Chapter said his comments erode trust, especially at a time when there's already tension between the African American community and law enforcement. "In regards to him being reinstated I'm not happy with that because if this person is out there patrolling and if his first thought was to see a group of people and say porch monkey what is he going to do when he has to stop someone," said Omar Montgomery, the President of the NAACP's Aurora Chapter. Chief Metz said many of his own officers were unhappy with DeShazer's return. He promised to continue efforts to improve community relations but admits these comments will impact the department's credibility. "I think the damage that's been done to the department, the damage that's been done to the relationship that will likely happen between the department and the community is huge," said Chief Metz.